The revolution of 1979 in Iran was visualized like a remedy in the minds and hearts of Ahwazi Arab people who were yearning for freedom and justice after having been oppressed by tyrannous and fascist policies of the Pahlavi regime. The Ahwazi people, like other ethnic groups, pinned their hopes on the revolution because it was the only recourse for the freedom from racial oppression. More than every other people in Iran, Ahwazi people were victims of anti-Arab policies of the Pan Persian Pahlavi regime. For this reason, they inspired to join the revolution so as to achieve their national rights and abolish the racial injustice and racism that had been practiced against them for years. However, in the early months of the revolution, all the hopes of ethnic groups including Ahwazi Arab people despaired after the revolution’s objectives turned out to be merely delusive slogans. The Islamic Republic regime, to reach their illegitimate goals and continue to dominate over non-Persian ethnic people resorted to the worst type of racist tools. The Mullah regime with much more aggressive policies in comparison with the previous Pahlavi system, has continued to carry out the ethnic cleansing policies through changing the demographic composition of Al-Ahwaz. In this period, the policy of changing the population structure of Al-Ahwaz in various forms has been widely implemented. Exile is one of the tools that the Islamic Republic regime, like its predecessor the Pahlavi regime, has used it against Ahwazis. This punitive measure is employed especially for those effective Arab intellectuals and influential political figures who have been campaigning to gain some of the social, political, cultural, and economic rights for the Ahwazi people. The regime, by applying exile, is seeking different goals such as disconnection of Ahwazi intellectuals with their society as a step for depriving the society of benefits of the intellectual’s insights. Besides the displacement of intellectuals, the regime is attempting to submerge the intellectuals and their families in the host community (Persian community) in order to prevent the continuation of their influence on the next generations. As a matter of fact, in the early days of the revolution, the institutionalized policies, of banishing Ahwazi people to Persian regions, was carried out with greater frequency and intensity. However, later with the outbreak of the Iran-Iraq war the exile and displacement of Ahwazis practically took on new and broader forms as this time there was no longer need for Iranian courts’ decisions to carry out the banishment of Ahwazis. This is because of constant fears of rockets and mortar shells of the war that forced many of Arab people out of Al-Ahwaz. As it is estimated that around 1.5 million Ahwazi civilians have been relocated in provinces of Fars, Isfahan, Khorasan, Tehran and many other places. Khomeini said war was a blessing for us. These ominous words today apparently reveal the destructive and the murderous theories that had been set against the Ahwazi people during the war. The Iranian occupying theorists viewed the war as the best opportunity to implement their horrid goals and make them facts on the ground. The Ahwazi liberationist movement was a serious obstacle for the Iranian totalitarian regime. Therefore, the large-scale turmoil of the war was an unrepeatable time for the government to liquidate most of the Ahwaz’s political class once and for all so that they could never become a challenge to the regime that see the demands of Ahwazis incompatible with its centralized ideology. Finally, the Iranian death squads operated massive extrajudicial killings of any Ahwazi who was suspected of having cultural or political activism by accusing them of being a fifth column, or engaged in espionage or sabotage activism for Iraqi forces. By the end of the eight-year Iran-Iraq war, many Ahwazi political forces called for the establishment of political and cultural institutions, but the governments of the time did not respond to any of the demands. At that phase, the Ahwazi Arab movement suffered the greatest human losses due to repression by the Islamic Republic regime, as hundreds of Ahwazi cultural, civil and political activists were executed, based on unfounded accusations like treason charges. Additionally, the cataclysm of the prolonged war operated as a potent weapon in favor of the Iranian regime to displace Ahwazi Arab inhabitants and as the conflict reached its fiercest peak the war-stricken cities such as Abadan, Mohammareh, Albseytin and rural areas in borderline which exposed to extensive havoc and damage were almost deserted and its Arab population moved to the central regions of the Iranian plateau thereafter they were scattered among different cities. As a consequence, the large active part and one of the most efficient pillars of Ahwaz society, particularly in Mohammareh city, has been practically excluded from influencing the movement of the Ahwazi Arab nation. After the war, the successive governments had undertaken similar policies against the Ahwazi people. They refrained from allocating part of the economic budget to the reconstruction of the devastated infrastructure of the war-ravaged regions, especially in the cities of Abadan and Mohammareh. In this way they were able to foreclose any possibility regarding the return of the Ahwazi people in exile to their homeland. Thus, the Iranian occupying state had pioneered in contemporary history of the Middle East in one of the largest changes of demographic composition, that of uprooting the Ahwazi Arab people. As always, the regime, with overt relocation programs, sought to use the condition of the war-torn areas from where its Arab people had largely evacuated during the conflict as an excuse to prevent and discourage the return of thousands of its original inhabitants. The regime did not reconstruct these areas, particularly those bordering villages and instead have declared them as prohibited military zones and have cordoned the areas off with barbed wire and patrols leaving it empty to this day. In fact, the Arab people belonging to these rural areas after fleeing their villages were relocated in shanty town and marginalized areas around Ahwaz city and other urban areas outside Al-Ahwaz. They waited long years to return to their villages, but their hopes have steadily weakened and became a mirage contrary to what they had previously assumed; that they could come back to their homes soon after the end of the war. The Arab people have lost not only their villages, but also their agricultural lands. They retain countless mines and unexploded rockets. 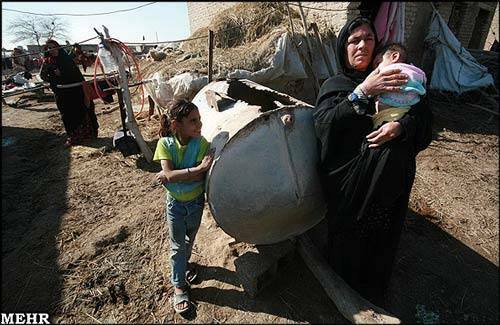 The Iranian governments did not attempt to restore and de-mine the agricultural lands from the remains of the legacy of the war and in exchange used it as a preventive measure with which to deprive the Arab villagers from cultivating their lands. 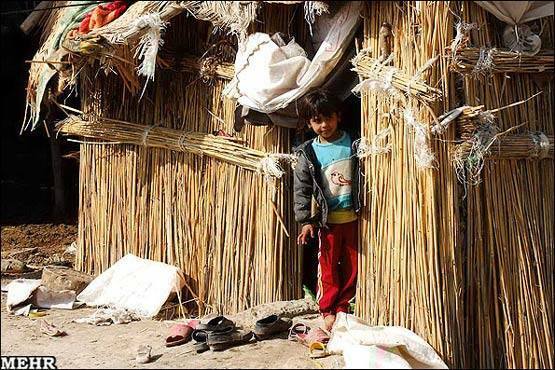 Such measures have caused the Arab villagers prefer to live under the harshest conditions in the margins of the metropolis of Ahwaz and to not return to their ruins.